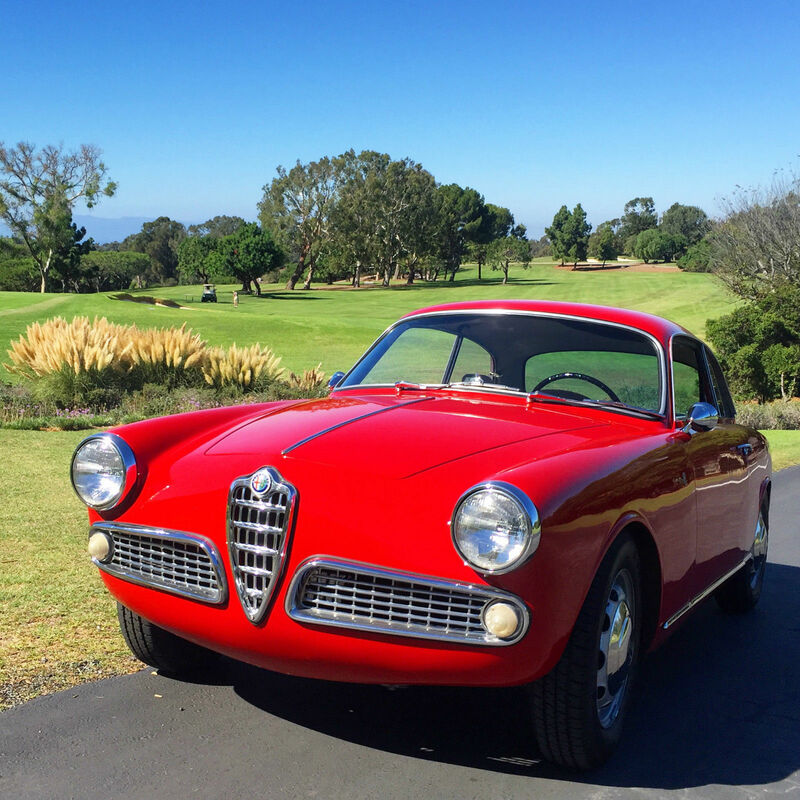 Update October 5 2015: Incase you spent the last 4 years wishing you had bought this car – well, you get another chance. It’s back on eBay. Looks to have been improved a bit, but still has a ways to go. Paint is looking pretty good these days. Grill is still from an early 750B or Spider. Good luck adding a front bumper if that’s something you would care about. Update September 5 2011: Wow, $25,800 is pretty serious for this car. Ummm, maybe I should stop driving mine every day? Nah. 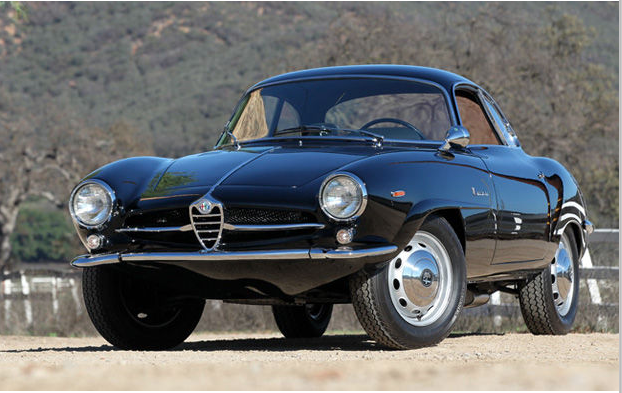 Giulietta Sprint 10105 1493*21083. 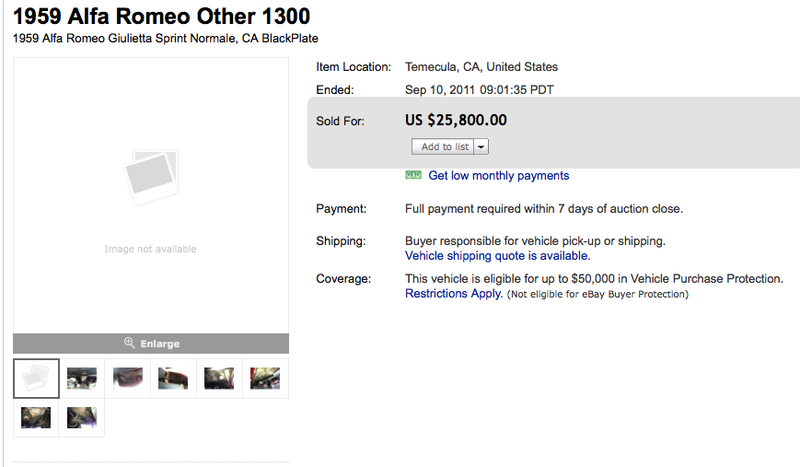 This car is on eBay right now out of Temecula in southern California. Car wears its original California black plate but none of the originality usually associate with a black plate car. A lot of difficult to source trim is missing, engine is incorrect, interior is mostly wrong components with incorrect finish among other things. It runs and drives (yay) but will require a lot to be original. 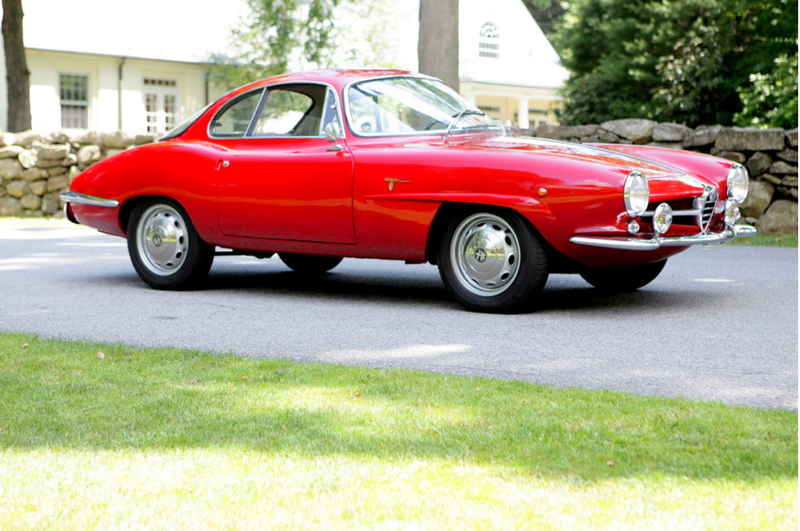 Would make a great beginning for a CSRG or other vintage racing group car. Looks nice though. Don’t get me wrong, it is a nice looking example. Sprints are good cars, this example would bring a smile to your face every time you drove it. I don’t mind the lack of badges, bumpers or hubcaps, but the trim that runs along the top of the rockers is necessary to the shape. Market 312: Nicely modified 10105 Sprint at FJ -Sold! 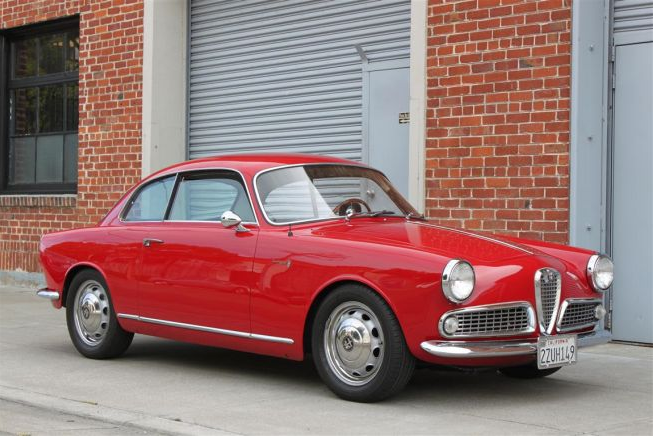 Giulietta Sprint 10105 1493*21131. This car was recently sold through Fantasy Junction. Asking price was about $56,000. I believe this is a car that was sold through Cars Dawydiak a few years ago, but I’ve seen a lot of these cars, so I may be mistaken. Even though it has been sold, I thought I would do a quick write up since it’s a nice but non-original normale that has been hot-rodded and that sold for more than a few recently sold, nearly perfect restored 101 Normale’s I’ve seen. An interesting data point for those that care. Update 4/20/13: Hard to argue with the same result twice. 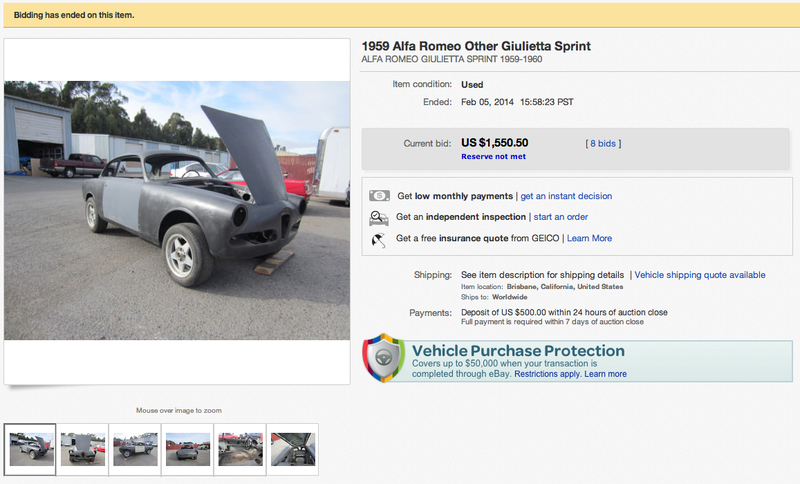 Update 3/31/13: This car has turned up on eBay again. Although it has been 14 months since it was listed, the same pictures are being used. I don’t think the market for a Spider like this has moved up much, so I suspect a similar result to the last time. I like the last line of the ebay description: “Look close, see the reserve? See the buy it now? I didn’t think so, there is NOT a buy it now, and the reserve is private. That’s how I thought it worked. I am an honest guy, selling an honest car, running this AUCTION honestly. I don’t want to play any games. Thank you.” I’m not sure how effective coming across as prickly is as a first impression, but then the notion of an ‘online persona’ is generally accepted. Update 1/9/12: $15,101 is the sale price after 5 bids. That’s pretty solid money. 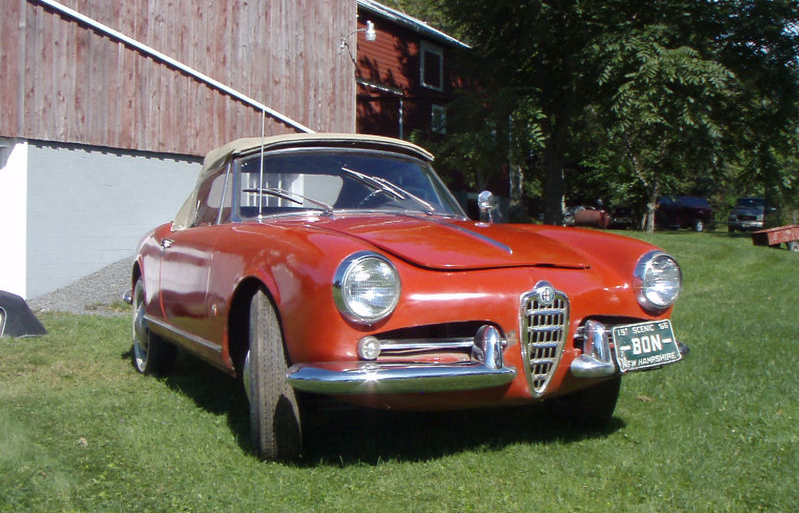 Giulietta Spider 10104*09537. 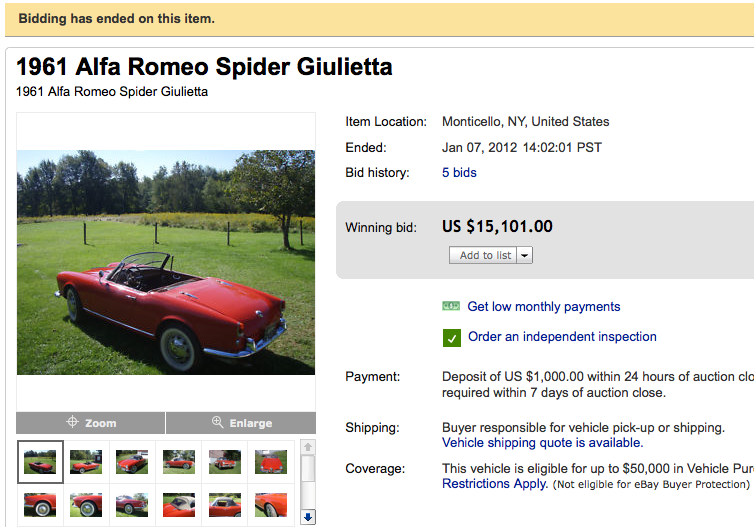 This Spider is on eBay out of New York with a starting bid of $8,000. Condition is pretty reasonable as the start of a light ‘run it as is’ type project. Seller says it doesn’t run currently and has had some floor repairs. 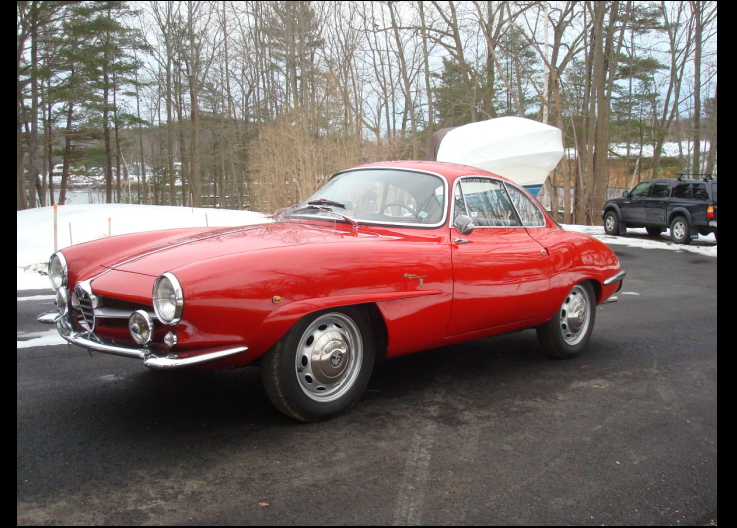 It comes with a hardtop that is one of the made in California FiberFab (??) type. I like the license plate! It really doesn’t look bad. It could be the basis of a decent driver without much fuss. The engines can always be made to run, but will probably require a minor overhaul. 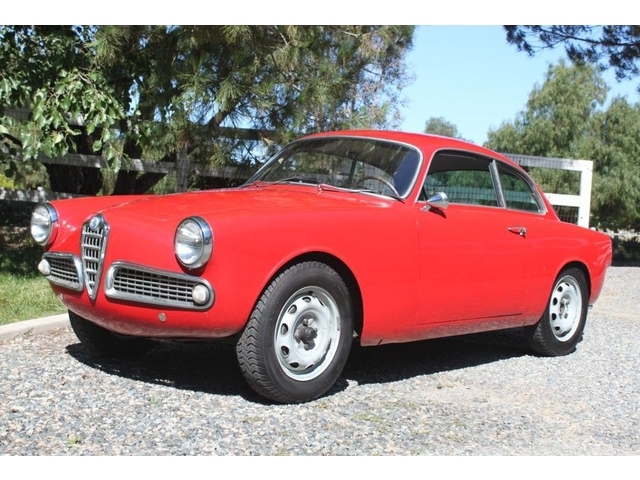 I like them without the grill ‘eyebrows’..
1/4/13: I am pretty sure that this car, Lot #132, is the same as the car below and is being auctioned by Gooding & Company on Saturday, January 19th. Estimate is an aggressive $200,000 – $225,000. The transformation is remarkable. Would love to see it in person. Update 7/22/12: Available now from Motor Classic and Competition Corp. Interesting that this car has failed to find a home with so much demand for SS’s right now. Update 4/2/12: Guess who’s available again? This SS. It’s now on the East Coast now, listed on Hemmings, and with a new fun asking price of $129,500. Does this herald the arrival of market malaise? Are we approaching a correction? How many SS’s at greater than $100K can the market support? Survivor-ship is high for a limited production car -probably approaching 15% documented on this site alone. Costs more than this? Update 9/13/11: Again. I wonder how much they’ve spent on eBay auctions?? My advise to the seller – a change of venue after a few months pass. Maybe Amelia Island. Ebay is alright for 3 year old ipods and disassembled Sprints but a seriously nice SS? Time to move up into the major leagues. But what do I know. Update 9/1/11: “We have made deals on this car twice on eBay now, only to have the buyer renege on his contract due to financial issues without seeing the car in person. PLEASE MAKE SURE YOU HAVE THE FINANCIAL ABILITY TO PURCHASE THE CAR before bidding, and especially before having us mail you sales documents and pull all of our advertising. If you are financing or running the car through a leasing company, make sure you are pre-approved. Each time this happens we lose other interested parties who ARE able to purchase the car. Thank you for your consideration.” That explains it. Rich guys drunk eBaying. Update 8/26/11: As predicted, this car is on eBay again -this time with new improved pictures and lengthy description attached below. This is a great car, it’s just not going to go for Gooding money on eBay. I know that bridge -about 15 minutes before you get to Big Sur when headed south on 1.